To simply sit. To do absolutely nothing. The air outside is warm – so warm that I don’t feel it surrounding my bare skin. I should get up and do something; sweep the deck clear of all the brown dried pine needles, put away the wood sander, coil the garden hose back on its holder, wash the dinner dishes from last night. So much that could be done. But I don’t move. The chair cushion is soft and encompassing, almost too warm under the shadow of the umbrella spreading its rust-tinged grey fabric over me. I don’t want to move. High above me, in the upper reaches of the trees, the sunlit, dry and yellowing leaves of the birches flutter in a breeze that barely works its way lower, to move my hair against my neck and whisk away the dampness from my skin. One time Jersey girl that I am, I close my eyes and imagine that the sound which the leaves make as they rustle against each other is the sound of salt water boiling up against the wide white sand of the Jersey shoreline. All that is lacking is the rhythmic pounding of the waves. But I can pretend, can’t I? 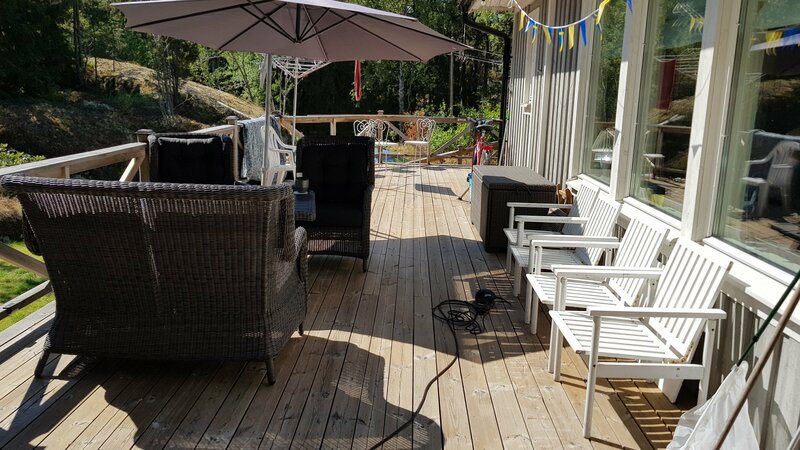 Last week, we washed the dirty grey from the deck’s wide boards. They look almost new-laid except for the uneven warping and dry fissures that give away the fact that they’ve been there a long time. In the sun, the wood is almost too hot to stand on with bare feet. They remind me of the Boardwalk, running along the Brooklyn beaches from Brighton to Coney Island, that I walked on with Grandma long ago. If I descend the staircase leading from the deck, will I arrive at the dry patchy grass of our sorry excuse of a lawn or to the blinding hot, white sand which leads to the far away water’s edge? My eyes are closed. Who can tell what I will find? I still remember the summer of 1997. My son was only six years old then. We had an inflatable wading pool, nestled on top of the uneven moss and grass-covered rock below our tiny cottage, for him to splash around in. The summer was hot and long and dry. I emptied everything out of the mildewed tool shed, laying all the junk on a tarp spread on dried moss, without fear of anything getting rained on and wet – it hardly ever rained that summer. All summer, my husband and son spent hours lying in a hammock suspended between two birch trees, using paddles to swing themselves back and forth, pretending to be sailors on the open sea. That was also the summer we built our Friggebod. Or at least, the carpenters we hired built it. For many years, it was the only mold-free house on our property. One of the birch trees gave up and died many years ago. We no longer have a good place to hang the hammock,so it sits rolled up on a shelf, in the over-crowded and still musty tool shed. Five or ten years from now, I’ll sit with a cup of tea in my hands and remind friends of the summer of 2018 – how long it was, how hot it was, how sunny it was, and how dry it was. How wonderful it was. Hopefully, it will be the occasional exception to the rule, worthy of remembering and not become the expected normal Swedish summer. It rained this year on Midsommar afton. It was practically the only rain we have had all summer. But, then, what would Swedish Midsommar be without a little rain? A Minyan is the Hebrew word for a quorum of ten Jewish adults required for certain religious obligations. The most common activity requiring a minyan is public prayer. According to the Orthodox view a Minyan requires 10 Jewish men to be official. The Reform movement says it only needs to be 10 Jewish adults, either male or female. I’m on the side of the Reform movement and I feel I can be flexible as to the number 10. Rosh Hashanah was just around the corner. This is the Jewish holiday celebrating the arrival of the Jewish New Year. It comes around just as the leaves start to change color every fall but it’s not always on the same day in the ordinary calendar so it can be hard to keep track of, if you are not actually looking for it. Together with Yom Kippur, it is one of the most important of the Jewish holidays. It’s usually celebrated with other Jews by going to synagogue, to pray together. When I was a kid, I would be dragged along by my parents to the relatively new Reform synagogue they were members of. In my early twenties, I would sometimes come home to visit my folks for Rosh Hashanah and spend the day with them in synagogue. After services, when we got home in the afternoon, we would eat dinner together. I never belonged to a congregation when I lived in New York – didn’t seem to feel the need for it then – I had my family to be with. But in spite of all this I still wanted to join our family get togethers, especially the big ones, Passover and Thanksgiving. Those holidays were celebrated either in my parent’s home or my uncle and aunt’s home. On smaller holidays such as Mother’s Day, we would all meet up in New York City at Radio City Music Hall and see a show. Then we would drive down to Chinatown for dinner. When we were out in public we were more civilized; though I do remember an interesting argument between my grandmother and her son, my uncle, about how to use chopsticks. I remember sitting there, as others talked about what to order – always a lengthy process – watching the two of them; just waiting for the irritation to build up into an explosion. I really wanted to be sitting at a different table with other diners during that meal. After us kids started to move out, live on our own, there were less and less gatherings. We still met for Passover and Thanksgiving though. I always took the bus from New York City home to New Jersey, to my folks or to my uncle and aunt’s. But then, I moved to Stockholm and that was a lot longer than any bus ride could take me. The years passed and my son came along. I discovered there was a Jewish Center here in Stockholm and when my kid was a year old I started taking him there to a mother/toddler sing-a-long group once a week. I could speak Swedish by then, though fluent was not a word I would use to describe my skill. I learned to sing baby songs in Swedish. I had no idea they were also in English – well, maybe I recognized the Swedish version of Itsy Bitsy Spider. The older my kid got, the more I started to feel the need for family – Jewish family – on my side of the ocean. And I needed it in English – because Moses said “Let my people go”. He didn’t say “Släpp mitt folk”. So in 1997 when my son was almost 6 years old, I put an ad in the American Woman’s Club magazine saying I was looking for other American Jewish mothers to join me to celebrate Jewish holidays with our small kids. The 6 or 7 women who responded were women who I had met occasionally during the past few years at one thing or another. We always said we should get together but we never did. Finally that fall, on a dreary grey day, we all met and celebrated Rosh Hashanah together. We started with Tashlich, the ceremony where we “cast our sins into the depths of the sea”. Together with our kids, we walked down to a nearby lake and threw our bread crumbs, symbolizing our sins, into the water. Just as we were about to leave, the sun came out from behind the clouds and shined down on us. I couldn’t have ordered better special effects. I figured God was giving us his approval. Back in my friend’s house, we lit candles and said prayers over challah and apples dipped in honey and sweet red wine, in both English and Hebrew (I had to do some research for that). Then we ate chicken soup, and brisket and chicken with honeyed almonds and sweet noodle kugel and teiglach. All made from Jewish recipes we had to look up because most of us had never bothered to ask our bubbies how to make these dishes. It didn’t matter. They were all wonderful. We have also joined together for Bar Mitzvahs and Bat Mitzvahs and school graduation parties. We have consoled each other over dead or dying parents and have rejoiced with each other for birthdays and anniversaries. And we have eaten many, many more helpings of brisket at our cyclical celebrations of Rosh Hashanah. I had found my family. I had created a minyan – on this side of the airplane flight. This past fall, the leaves were starting to turn color and it was Rosh Hashanah season once again. A few weeks earlier, Janet, one of my J.A.P.S. since the very beginning, texted me to ask what we were doing for Rosh Hashanah this year. She was the only one who asked. I realized I didn’t really have an answer for her. It wasn’t like I didn’t remember that it was coming up. It was sitting there in front of me like a giant sign on a highway in Kansas. But I just wasn’t feeling very Rosh Hashanah-ish. Every year I invite my J.A.P.S. to my place for Rosh Hashanah. I live right near water so that makes the bread crumb thing easy. People bring tons of food with them. We go down to the canal in front of my building and throw our sins out to the ducks who greedily eat them up. Then we trek back up to my apartment to say our now memorized blessings over the wine and candles and challah and apples. We eat and schmooze; until the food is done and it’s time to go home. But this year, I didn’t send out any emails asking who can come. I didn’t tell people what time it would start or what food they should bring. My apartment was a mess and I had no desire to clean it for company. I just didn’t feel like doing any of the organizing that I always did to make sure our get-togethers got together. Throughout all the years we have been meeting, it’s always been me who organizes each event. Regardless of what day the holiday falls on I decide for us to meet on a weekend. That usually helps to assure attendance. First, I send out SAVE THE DATE emails. Then I send out emails asking who can come. A few years ago I started sending the emails directly to the kids who have their own email addresses. They are now old enough to decide for themselves. Often I don’t just ask. I coax and cajole and wheedle them into joining us. I feel it’s important to get as many as possible to come. I organize the symbolic food we need to celebrate the holiday and the food we just eat and I suggest who should bring what, based on understanding of each individual’s cooking skills. The Holiday Bag no longer appears – the teens started to revolt – so I stopped with that. And to be honest, I now have trouble remembering all that information I once taught them, so it’s easier not to bother. So… mostly… now we just gather together with all our food, say the blessings and then we eat. (and schmooze of course. It wouldn’t be Jewish if there wasn’t a lot of talking) I know everyone has a great time and enjoys being with each other in spite of my bully tactics. And it’s usually only at Passover that I get so over-stressed that I start yelling at people. Eventually some brave soul dares to take me by the arm and bring me over to a quiet corner to sit and calm down. But this Rosh Hashanah I was already really tired and I hadn’t even started. I didn’t have the energy to herd cats. I don’t think any of my J.A.P.S. are particularly Jewish in the sense of religious. They are like me – a pretty secular bunch. But over the years, many of them have said to me how glad they have been that we meet, that I organized these holiday events, that I taught their kids some Jewish knowledge. They appreciate and thank me for what I did for them! I try to respond modestly. But the truth is I didn’t do it for them at all. I did it for me! I did it because I wanted a family here. I wanted a small community of English speaking Jews like myself to raise my child in, to be Jewish with. Hilary Clinton wrote “It takes a village” and I built myself a village. I finally understood the meaning of the concept of a minyan. It had nothing really to do with men – and the number 10 is simply an approximate tipping point for being able to build a community. The J.A.P.S. became my Minyan, comprised of Jews and Goys and our children, who I hope learned to feel Jewish because of what I did. I never bothered to count the number of Jewish heads. Back in the states, my parents are gone. My Uncle and Aunt are over 80 and not up to having big family events at their home. Some of my cousins have taken over the task of family gatherings, at least for Passover and Thanksgiving. Not being there, I don’t know more than what Facebook tells me as to what other sorts of family shindigs get organized. At this point in my life I can do pretty much anything I want. So what is it I want? Probably what I always wanted – to be wanted, to feel needed and to feel part of a community. So instead of the usual big gathering we were just a few. I made a big batch of honeyed chicken and rice. Janet came over with a bag of salad. Her boys came too. Risa came by because she called at the right time. She brought brownies. And Evelin, another of our youngsters dropped by at the last minute. We blessed apples and honey. We ate Challah that Håkan baked. We sat and ate wherever there was room in my messy living room. And as I sat there with the others, I decided that my Minyan was just the right size. I just started my second reading of An Echo in the Bone, Diana Gabaldon’s seventh novel in her Outlander series. I’ve gotten as far as the Prologue. The body is amazingly plastic. The spirit, even more so. But there are some things you don’t come back from. Say ye so, a nighean? True, the body’s easily maimed, and the spirit can be crippled – yet there’s that in a man that is never destroyed. And barely as the last word was read, my eyes started to fill with tears and I realized I was crying. How? Why? Am I that much of a sentimental sap? I never thought so before. I have been reading and re-reading these books (and watching the TV series by Starz) since discovering first the show and then the books in the beginning of 2015, after my friend told me about them a few months earlier. And I can’t seem to stop. I can’t seem to be able to leave the world that Gabaldon has built and come back fully to my own. What is it about Jamie and Claire’s love affair and adventures and marriage and life that makes me want to be there with them instead of in my own life? Granted, the last 4 years have been difficult ones, filled with sorrow, disappointments, illness and changes. In 2011 my mother got sick and at the very end of that year I spent the last month of her life by her bedside in New Jersey watching as she slowly passed away. You can read about that month I spent with her under Saying Goodbye to Mom. On a cold January day my family and I said our final goodbyes at a wonderful funeral (if one can call a funeral wonderful) and a joy-filled Chinese lunch (her favorite sort of food) with friends and family. And then I returned to my home and my life in Stockholm. Once back here I managed with great help from her Finance Guy, Dave, to settle all her bills, tie-up loose ends, and pull together what needed to be done to file her estate income tax forms. Done! Chapter settled and closed! Or so I thought. Then 2 years later, I received a letter saying I was being sued for unpaid property taxes! It seemed that the person who had been renting the property that I had inherited from my mom had not been paying said taxes as he should have been and now I was required to pay a huge sum of money in back taxes and interest. I almost had a heart attack. As luck would have it, I actually had a lawyer who could help me and even just enough money to save my property. The stress from dealing with all that finally ended up causing me to decide to start taking anti-anxiety meds. It has taken the last 2 years to finally work out the situation. I don’t believe in writing gratitude lists but I am very grateful for my lawyer Gary. He saved my sanity. What I have left of it at least. Then just after finding out I was being sued, I heard that my job as a graphic designer, that I enjoyed and liked working at was soon going to end. IGBP was going to be closing down at the end of December 2015 and as I write this I am now officially out of a job. And looking for a new one. I think…..
And as a last straw, in October of 2014, my husband got sick. He developed an aneurysm that started to bleed right at the top of his spinal cord where all those little nerves are gathered. He spent 2 months in hospital, needed brain surgery and almost died. He is home now and still himself but the bleeding affected certain nerves leaving him dealing, for the past year and a half, with a number of physical disabilities and has affected the way we see and live our life together – how we go forward. Oh, and did I mention those added anxiety and stress levels??? Sooo, as I said above, the past 4 years have been pretty crappy and I find myself often not really wanting to crawl out of bed. But when I do, I find myself still standing and even still able to make a joke. But I am almost afraid to open my email – who knows what disaster awaits me there. I don’t feel very much like socializing since I am boring even myself with my negativity about life and my lack of enthusiasm. I don’t want to keep spreading it around my friends or I won’t have any left, friends that is. Facebook and Twitter are my main social outlets – I don’t have to get dressed or put on my face for that! Or even leave my bed! I need to concentrate on finding a new job but I don’t seem to be able to muster much enthusiasm for that task either. Being a graphic designer is how I have earned my living most of my life and actually is the only work skill I really have. But, I don’t know – images are just all starting to look very grey. Words are what fill my head now. But getting the energy to sit myself down at the computer to write – that is so hard too. Its as though my computer has become my enemy and I can’t dare to face it. All my shoulda, woulda, couldas get saved to the very last minute before I can bring myself to attend to them. And I find myself getting very sloppy by the time I actually get to them. And its the sloppiness that bothers me. The not caring. The lack of … whatever it is I am lacking. Perhaps its just the will-to-do that’s missing. So I lose myself in Diana’s world. Its not the same as when I read over and over again Peter and Wendy (the original book about Peter Pan) as a child or lost myself in The Lord of the Rings as a teenager. Its not just escapism. Its like that prologue I quoted at the top of the page, that started me crying: I think I reacted to it because I too am looking for that part of me that is still not destroyed. The me that is still left. Her words are filled with that sort of thing that seems to be speaking to me directly. Her story of Jamie and Claire’s life, of how they are as a married pair – I wish I had that as an idea of a life together. I almost wish I had read her books when I was young, in my 20s. My parent’s married life, the only example I had, was not really happy and I admit to avoiding pairing up for a very long time because of their example. In reading how Jamie and Claire are with each other, it gives me a different model to follow in my own marriage. I almost wish I had learned those things 30 years ago. So I continue my Outlander obsession. Reading and rereading over and over again. Each time finding small bits and pieces that leave me weeping, with sadness or joy but still engulfed in tears, sharing their lives. Waiting for mine to recover and figure out what my next stage will contain. I sometimes wish I had Jamie’s resilience to disaster and hardship but maybe I have more than I think I have. I’m just waiting for it to bounce back so I can discover who I am again. Some people are travelers. They have the desire or need to see and experience as many different places as possible on this vast yet tiny globe that humanity inhabits. I am not one such. While I have traveled to a number of different places, I have made but two great journeys in my life and both of them have been journeys of the heart. The first was when I moved my suitcases across the Hudson River from my birthplace of New Jersey to New York City. There I found the city of my heart and thought I would stay there the rest of my life. My second great journey was across a wider river of water to Stockholm, Sweden because it was there my heart found love. Many of the people I have met here in Stockholm in the 25 plus years I’ve lived here are the traveller type. While on their journeys around the world they somehow for one reason or another have ended up here in my little corner of the world. And they continue to use this corner as a stepping off place from which to continue to explore the other places they are curious about. But this little corner of mine has become, for me, more like the last stop on the bus line. Not really a final destination but just the last stop, from which the bus goes no further. Now this doesn’t mean that I haven’t been anywhere except Budd Lake, NJ or New York City or Stockholm. I have travelled a bit in my life. I’ve been to Washington DC to visit with my roommate Roz and again to various towns in Maine to see her there too. I spent a great month in California when I visited another of my roommates, Lynne. We spent hours building up our tans round her swimming pool, then happy hour at the local Mexican restaurants drinking frozen margaritas. Together we traveled the coast road to San Francisco and went to the San Diego Zoo to see the Kuala bears. Greensboro, North Carolina is another place I’ve been to when I drove down there with three friends in a noisy Volkswagen bus to visit one more former roommate. On the way we stopped in a few local southern diners who’s customers didn’t seem to look too fondly on the four of us in our ratty bell-bottomed jeans and long, below-shoulder length hair (the two guys included). I’ve been to the Catskill Mountains in upstate New York to visit my friends Tom and Wally at their 100-year-plus house and they drove me on country roads up and down the very green hills. I took the train to Washington DC to visit my New York City friend Nancy after she moved there. And I saw the sights of Philadelphia when I went there to stay with Linda who I had gotten to know here in Sweden. I took the train down to the south of Sweden to visit Gerd at her house near Trelleborg. I’ve been to Denver, Colorado where one of my besties from Pratt Art school, Irene, lived with her husband. They took me up to walk amid the Rocky Mountains. I’ve been to Florida a few times. First to Hollywood, where my grandmother lived and later to Miami where my former Philadelphia pal, Linda, had relocated to. I went there with my husband and son and while there we, of course, couldn’t avoid taking in the sights of Disney World, Sea World and all the other theme parks in Orlando. I’ve even been to Heidleburg Germany when Håkan and I drove down there to visit my cousin Devorah and her husband and kids who were living there. So I have traveled around a bit. But if you look to see what the common denominator has been for all these trips it wasn’t because I wanted to see interesting places in the world. It was because I had people I knew in those places. The reason I traveled to those places was because I wanted to see the people not the scenery. I saw a bit of scenery on the side but it was the chance to once again meet the people I knew that enticed me enough to go to the trouble of packing my bags and going out on the road. Without the people, and the stories we shared, the places are just places. And I have to admit that in regard to places, the place I love the best is often one I find in my own home, where I can sit on the sofa, with my shoes off. And just relax with a good book. That’s really the only traveling I need. Tonight is the first night of the Jewish holiday of Chanukah. 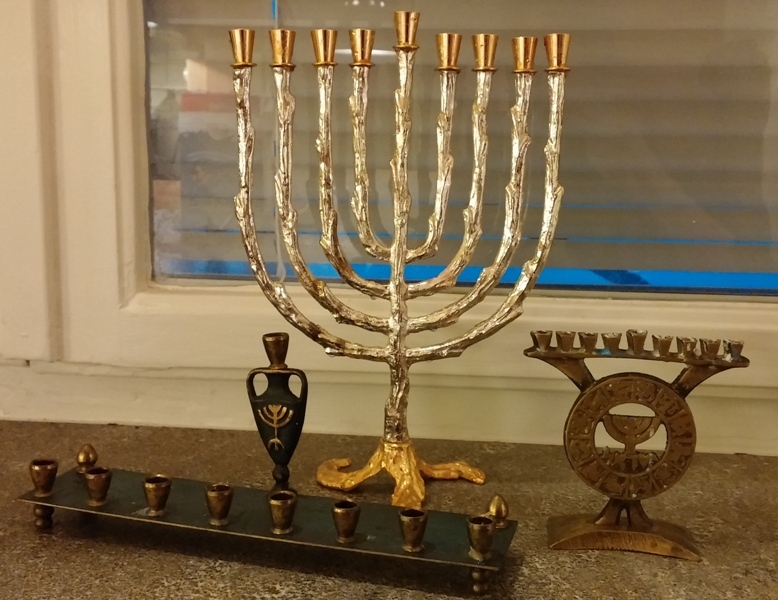 Chanukah is not one of the major Jewish holidays but because of its closeness to Christmas it has taken on much larger importance in the Jewish calander. The holiday actually has nothing at all to do with Christmas. It celebrates an event that took place approximately 165 years before Jesus was even born. The name Chanukah comes from the hebrew verb meaning “to dedicate” and that is what the holiday commemorates: the rededication of the Jewish Temple in Jerusalem after it had been desecrated by the local Greek-Syrian rulers. Jewish forces led by Judah Maccabee (Judah the hammar) revolted against these rulers and eventually won the war against them and restored the Temple. The story goes that there was only found in the Temple enough oil for the holy lamp to be lit for one day but a miracle happened and the oil lasted for 8 days, enough time to make more oil. So today we light candles for 8 days to remember the miracle of the oil. And eat oily foods like latkes and fried donuts. But the real story, the back story, was probably not so wonderful. Judea, the Jewish kingdom that Jerusalem was the capital of, was a conquered kingdom, ruled by the Greek-Syrian Selucid Empire, the local remains of what had once been Alexander the Great’s empire. During the time when the events of the story happened the lure of the hellenic culture was very strong, even in the Jewish kingdom. The hellenized, secular Jewish faction was in conflict with the Jews who were much more consevative and felt Jews should live strict Jewish lives and not follow the Greek hellenistic way. When Antiochus Epiphanes, the Selucid Emperor, sided with the hellenized Jewish faction, the conservative Maccabees revolted and cast out him and his forces. The whole thing was in effect a civil war, Jew against Jew, with the help of some outside forces. But the religious leaders who came after the war didn’t want to commemorate and keep remembering a civil war, Jews fighting against Jews, so they came up with the miracle of the oil in the Temple and Jews once again being able to be Jews. They felt it was better to remember the positive and put aside what was evil. So to this day, when we celebrate Chanukah we celebrate by remembering the miracle of light. A much better thing to remember as I see it. And when we light the candles on our Chanukias we always add one more candle each night. Each night we add more light! I now own 3 chanukiah, as the special 9-armed menorah is actually named. The largest is a silver and gilt one that my mother bought for me sometime after the birth of my son – for us to use as a family. The smallest one, on the right, is a gift given to me by my cousin Karel when I moved here to Stockholm so that I could remember my family back in New Jersey while I celebrated the holiday here in my new homeland. The third one, the middle-sized one in the front, is actually my newest yet my oldest. It is the one that my family lit thoughout my childhood and which I only brought back with me to Stockholm after the death of my mother three years ago. The two larger chanukiahs use the customary chanukah candles one buys in any judaica shop. The small one uses birthday candles. Tonight, the first night, my son Bevin and I will light all three and Bevin will be given a small gift. The holiday is about the lighting of the candles and presents are not really relevant. The giving of gifts on each night of Chanukah is more a response to the gifts children get for Christmas. The more important thing is to light the candles. 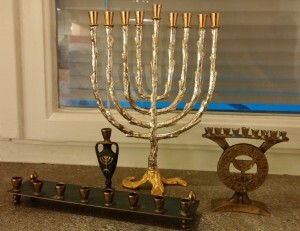 In these dark days, when a member of the Swedish parlament says that Jews can never be considered real Swedes, when Islamists and Palestinians claim that the Jewish people have no right to be in Jerusalem, when synogogues are once again being burned, and Rabbis are attached, I am glad I can light my Chanukah lights together with my son, in freedom, in my home, in the land I live in. The candles remind me that Jews lived in Jerusalem over two thousand years ago, before Christianity existed, before Islam existed. Now we live in many countries. We know how to live as Swedes and as Jews. As Americans and as Jews. Being Jewish is a plus situation. It isn’t an either/or proposition. We can be both a true citizen of the country we live in and a Jew at the same time. We know how to integrate without losing our identity. We have been doing it for over 2 thousand years. In this cross-cultural world we live in, this is something we can teach the world.